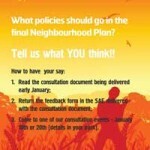 Click here to put your ideas forward in the Neighbourhood Plan discussion forum. The purpose of the Neighbourhood Plan process is to preserve and enhance the quality of life, environmental attributes, economic growth and characteristics of the neighbourhood through the empowerment of local people and communities. Huby Parish council have the ambition of being at the forefront of this exciting opportunity. The Huby Neighbourhood Plan will ultimately set out what the community wants for Huby, both now and into the future. This plan will become an official planning document to be used by Hambleton District Council to guide economic development, infrastructure and planning in Huby for the next 15 years. To do this we need your help – this is a community project, please tell us what you want from Huby, what issues you are concerned about, and what opportunities you think there are for the community. This could be about anything at all, from employment, community facilities or environmental issues, to where in the Parish you think new development should be. We will engage and listen to everybody to prepare a plan that meets the common needs of Huby. The process is to be open and transparent and is put to a community referendum once compiled. A group of volunteers from within Huby, representing a complete cross section of the community, has been tasked by the Parish Council to develop this plan. 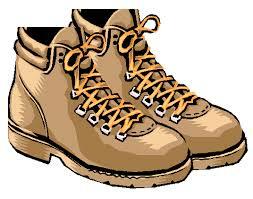 We will be listening to everybody with an interest in Huby about what is important to them. 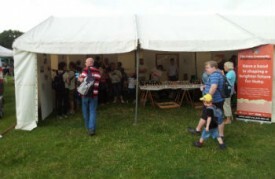 We will then produce a draft Neighbourhood Plan to be agreed by the Huby community and Hambleton District Council. Inclusive – giving the opportunity for everyone who works or lives in Huby to participate. 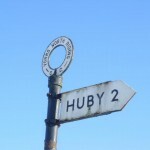 Comprehensive – identifying all the important aspects of life in Huby for which we need to plan for the future. Impartial – the Huby plan is to be a forward looking document, engaging and exciting. We are hoping to get the draft Neighbourhood Plan written by the end of 2013 so it can be agreed by the community in a community referendum and submitted to Hambleton District Council in 2014. This is your opportunity to have a hand in shaping the future of Huby. Fancy a drink on us? Hands up if you’ve spotted one of our posters?